Del Ray Psych & Wellness celebrated its grand opening and ribbon-cutting on Sept. 19. The new business, which brings together a wide range of wellness professionals to offers a holistic approach to health and wellness treatment, is located at 1900 Mount Vernon Avenue. "We are so blessed to create this holistic health and wellness center," said Dr. Lauren Fisher, the co-founder of Del Ray Psych & Wellness. "This is a hub of wellness connecting the community to different resources to help them live their best lives." Del Ray Psych & Wellness, formerly known as Del Ray Psychological & Wellness Associates, is a new partnership between colleagues and clinical psychologists, Dr. Lauren Fisher and Dr. Eleni Boosalis. The new business includes nine professionals offering psychotherapy, hypnotherapy, career counseling, holistic nutritional counseling, wellness coaching, acupuncture, and more. The location also houses two tenants with complimentary businesses of massage therapy by Michael Nicotra of the Vital Body and a naturopathic physician, Dr. Patrician Dienfenbach, of Natural Integrative Healthcare. "So many people and synchronistic events have brought us here," said Boosalis. "We are so thrilled to welcome Del Ray Psych & Wellness to Mount Vernon Avenue," said Del Ray Business Association President Sue Kovalsky. "Our community is known for its award-winning health and wellness providers and fitness studios. This one-stop-shop for helping people live happy and healthy lives is a tremendous addition to 'Well Ray.'" At the event, Del Ray Psych & Wellness also announced its new "Wellness Wednesdays" program, featuring free classes hosted by wellness professionals every Wednesday from 7 p.m. to 8 p.m. at 1900 Mount Vernon Avenue. "Our vision is to offer free services to the public that feature useful strategies for every day life from different wellness practitioners in the community" said Fisher. "Our goal is to foster community connection while delivering these classes and other programs in a variety of interesting and innovative formats." Del Ray Psych & Wellness is vibrant and energetic group of clinical psychologists, therapists, and wellness professionals located in the heart of the Del Ray area of Alexandria, VA. The group is passionate about guiding individuals on their personal journeys of growth and transformation by using a holistic approach and providing a wide variety of experiences and techniques to treatment approaches such as mindfulness meditation, cognitive-behavioral therapy, hypnotherapy, art therapy, and nutritional counseling. For more information and to register for classes please, visit www.delraypsych.com. During National Wellness Week (Sept. 16-22), local wellness businesses in the Del Ray neighborhood of Alexandria will feature free classes, educational talks, and discounts throughout the week. 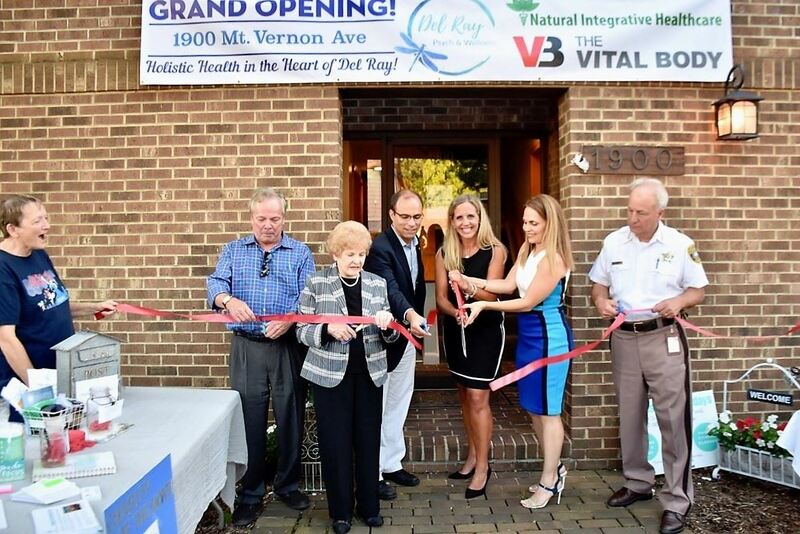 The Well Ray businesses of the Del Ray Business Association are dedicated to providing the community with services that contribute to a strong foundation of wellness. First Thursday: Show Your Spirit! takes place on Thursday, September 6 from 6pm to dusk in Del Ray. Wear your team colors and head out to the Avenue for live music, themed activities, and more. The event is free and open to all. Participants are encouraged to bring school supplies for Community Lodgings; for a full wish list, visit tinyurl.com/sept1stth. Donations can be dropped off at the Pat Miller Neighborhood Square, located at the intersection of Mount Vernon and Oxford Avenues. Community Lodgings’ mission is to lift families from homelessness and instability to independence and self-sufficiency through transitional housing, affordable housing and youth education programs. For more information, visit www.communitylodgings.org. The Del Ray Business Association will host a pop-up retail market featuring local artisans and home-based businesses on Sunday, Sept. 2 from 11 a.m. to 3 p.m. at the Pat Miller Neighborhood Square, located at the intersection of Oxford and Mount Vernon Avenue. Participating retailers to date: The Board Bus; Truly-Life Eco Gifts; Made in Del Ray; AVA Apparel, Julie Kay Design Studio, BeautyCounter, and Ever Skincare. This summer, Holy Cow Del Ray celebrated their 400,000th burger -- raising over $100,000 for area non-profits. The award-winning burger joint donates 25¢ of every burger sold to local non-profits through ACT for Alexandria. "Holy Cow is leading the way in how businesses can support and be a part of the community," said Heather Peeler, President and Chief Executive Officer of ACT for Alexandria. "This has been a great way to involve the entire community at a beloved Del Ray restaurant." After ordering a burger, customers are given a second "menu" -- a list of 233 local non-profits -- to choose where the quarter will be donated. The list includes organizations that assist those in need, animal welfare organizations, schools, community groups, arts organizations, and much more. This program has been in place since Holy Cow opened its doors in November 2012. "We never thought a few quarters could make such a big difference," said "Mango" Mike Anderson, the owner of Homegrown Restaurant Group. "We're always glad to support the Alexandria community." "This epitomizes what is Alexandria -- such amazing local flavor, and letting people choose what matters to them," said Betsy Micklem, Director of Development for ACT for Alexandria, noting the wide diversity of organizations supported. Homegrown Restaurant Group includes Holy Cow, the sushi bar, and Pork Barrel BBQ in the Del Ray neighborhood of Alexandria. The group received the 2018 "Heart of Del Ray," as voted by the community, in recognition for their service to Del Ray. Due to weather, First Thursday: Aloha Thursday will be postponed until Thursday, August 9 from 6pm to dusk along Mount Vernon Avenue in Del Ray. The street festival features live music, themed activities, and more at the Pat Miller Neighborhood Square (located at the intersection of Mount Vernon Ave. and Oxford Ave.) The event is free and open to all. Wear your most outrageous Hawaiian shirt or Aloha outfit and visit the Pat Miller Neighborhood Square at 7:30 p.m. for the chance to win prizes -- pets can participate, too! Other activities include a Tiki Bar at the Bean Creative field sponsored by @home | real estate, a photo booth, a how-to on making healing leis, demonstrations by Titan Robotics, and more. Participants are encouraged to bring canned fruit (In fruit juices), canned meat (chicken, tuna, etc), and boxes of single-serving packets of oatmeal to benefit Hunger Free Alexandria. Donations can be dropped off at the Pat Miller Neighborhood Square. For more information on Hunger Free Alexandria, visit www.hungerfreealexandria.com. This month's First Thursday is co-sponsored by the Del Ray Business Association and The LizLuke Team. First Thursday: Aloha Thursday takes place on Thursday, August 2 from 6pm to dusk along Mount Vernon Avenue in Del Ray. The street festival features live music, themed activities, and more at the Pat Miller Neighborhood Square (located at the intersection of Mount Vernon Ave. and Oxford Ave.) The event is free and open to all. Wear your most outrageous Hawaiian shirt or Aloha outfit and visit the Pat Miller Neighborhood Square at 7:30 p.m. for the chance to win prizes -- pets can participate, too! Other activities include a Tiki Bar at the Bean Creative field sponsored by @home | real estate, a photo booth, demonstrations by Titan Robotics, and more. This month's First Thursday is co-sponsored by the Del Ray Business Association and The LizLuke Team. For more information, visit www.visitdelray.com. Local musicians will perform on two stages at the 11th Annual Del Ray Music Festival on Saturday, July 14 from 3 p.m. to 8 p.m. at the Pat Miller Neighborhood Square, located at the intersection of Mount Vernon Avenue and Oxford Avenue in the heart of Del Ray. Mount Vernon Avenue will be closed to traffic for the three blocks adjacent to the stage, and eight of Del Ray's top restaurants will host pop-up beer gardens. From jazz and funk to reggae and classic rock, the 11-band lineup reflects the diversity of the region's music scene. "Diversity is very important in my selection process for bands," said Del Ray Music Festival Chair John Patrick, the founder of Rock of Ages Music. "There is a wealth of music in the metropolitan area. I find it very important to give as much of it, as I can, the opportunity to be exposed to a new audience." 3 p.m.: Noise in the Basement -- This Alexandria-based band is one of the region's top Alt-Rock coverbands; their playlist "spans five decades of the best high-energy, popular and should-have-been-popular tunes." 4:05 p.m.: The Derds -- Nicknamed "The Hardest Working Band in Del Ray," this all-local band mixes covers with originals drawing from American roots and classic rock. 5:10 p.m.: Gordon Sterling And The People -- The latest project of guitarist and singer Gordon Sterling, a long-time fixture in the DC music scene, this band brings an "eclectic blend of psychdelia and soul with a touch of bluesrock." 6:15 p.m.: Greenland -- DC Music Download calls this group a "delightfully unorthodox quartet," while The Deli writes, "part literal lyric interpretation, part psych-colored basement jam session, their music is surely going to entertain you." 3 p.m.: Left on Lincoln -- Together since 2010, this 7-piece rock cover band made Arlington Magazine's list of 50 Local Bands and Musicians You Should Know. 3:50 p.m.: The Porch Lights -- Formed in 2015, the Porch Lights are the self-described "official house band of the Rosemont neighborhood of Alexandria," mixing working-class rock, indie faves and alt-country classics with a few quirky current tunes" -- and often for a good cause; last year the band raised over $10,000 for Gifts for the Homeless. 4:40 p.m.: Duke Ellington Tribute -- A group of local musicians will come together exclusively for the Del Ray Music Festival to pay tribute to the legendary Duke Ellington, an originator of big-band jazz. 5:30 p.m.: Dan Wolff And The Muddy Crows -- This award-winning Modern-Americana/Roots-Rock group specializes in original music, but also maintains an extensive repertoire of multi-genre covers. After winning DC's “Best Originals Band” contest in 2015 and 2017, they completed a month-long European tour, featuring 22 shows across 17 cities. 6:20 p.m.: Origem -- Performing in the metro area for over 15 years, this trio performs a variety of Brazilian music styles mixed with jazz and funk "to create an exciting unique sound like no other" -- with the mission to bring awareness of Brazilian culture through music. 7:10 p.m.: Feel Free -- This "genre-bending" band, together since their days at Alexandria's George Washington Middle School, returns to their Del Ray neighborhood for the music festival just a week after their latest album drops. Northern Virginia Magazine describes their blend of reggae, rock, funk, and jazz influences as "the sound of summer." First Thursday: Red, White, and Blue takes place Thursday, July 5 from 6pm to dusk along Mount Vernon Avenue in Del Ray. The street festival features live music from Mars Rodeo, themed activities, and more at the Pat Miller Neighborhood Square (located at the intersection of Mount Vernon Ave. and Oxford Ave.) The event is free and open to all. Participants are encouraged to bring new single or queen size sheets, new towel sets, new pillows, cleaning supplies, or grocery gift cards (in $10-$25 increments) to benefit New Hope Housing, a part of the City's effort to ensure there are no homeless veterans in Alexandria. Donations can be dropped off at the Pat Miller Neighborhood Square. For more information on New Hope Housing, visit www.newhopehousing.org. This month's First Thursday is co-sponsored by the Del Ray Business Association and The Jen Walker Team. The 4th annual Well Ray Festival takes place on Saturday, June 23 from 9 a.m. to 1 p.m., showcasing the wide variety of health and wellness opportunities in the Del Ray neighborhood of Alexandria. The event -- featuring free fitness classes, wellness demonstrations; health screenings, fitness-inspired fashion, cooking demonstrations, an interactive public art project, and more -- is free and open to all. "We're excited about this opportunity to showcase the many incredible fitness studios and health & wellness practitioners that have earned our neighborhood the nickname 'Well Ray,'" said Del Ray Business Association President Sue Kovalsky. Due to the festival's rapid growth, the Well Ray festival will move to Del Ray's main street, taking place on Mount Vernon Avenue between Custis and Uhler Avenues. "With over 60 health and wellness vendors, there are a wide variety of opportunities for festival-goers of all ages and fitness levels to explore, heal, move, taste, and listen," said Well Ray chair Kate Moran. Participants are encouraged to bring their own mats to join in enjoy free fitness classes led by top-rated health and wellness providers in and around Del Ray, including yoga, Pilates, spin, dance, karate, boxing classes, and more. Advanced registration for the free classes is available at wellraydelray.com/schedule. "Get ready to move at one of our many fitness demos, cool down with a beverage or healthy bites, and plan for the future with a life coach or counselor," said Moran. "We have something for everyone and every fitness level!" This year's featured non-profit is Rock Recovery. Rock Recovery is a nonprofit serving the Washington, DC area that supports the journey to freedom from disordered eating through an affordable outpatient recovery program and community empowerment events. For more information on Rock Recovery, visit www.rockrecoveryed.org. Well Ray is presented by the Del Ray Business Association, and sponsored by The Jen Walker Team. For more information, visit www.wellraydelray.com.